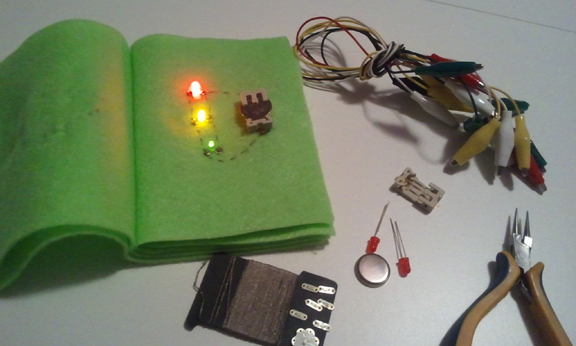 Intro to e-Textiles Sample Book – Cheryl Sleboda – Textiles. Technology. Texture. Teacher. In this hands on class, learn basic to advanced e-textile techniques to insert into various textile works of your own. We’ll cover the basics in a simple LED project, and take it further by adding sensors and switches! We’ll top it off by using a commercial chipset and learn to program it easily with your computer. You don’t have to be an engineer to do these simple and easy to understand exercises. Leave this full day class with a fabric swatch book of examples to inspire your future work! This class can be extended into a multi-day class, please contact Cheryl for more details!